While the name Sentey may not ring a bell to many folks, they have been providing PC enthusiasts with components since 2001. One area that Sentey has a decent spread of products is mice. Sentey currently lists 7 mice on their website, all with varying features and complexities. Everything from a pretty standard 2-button mouse all the way up to the Revolution Pro SP which we will be taking a look at today. With so many peripheral devices on the market to choose from, what makes the Revolution Pro SP stand out from the rest of the field? 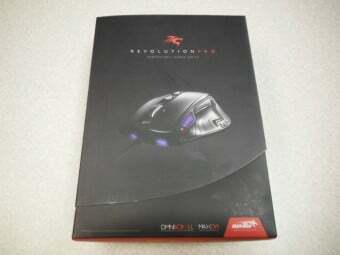 The Revolution Pro SP is Sentey’s top-of-the-line gaming mouse, designed for gamers of all levels. This mouse is packed with features designed not only for performance, but comfort as well. Knowing that gamers in today’s world are not playing a single game, Sentey provides multiple profiles to allow a customized experience across multiple platforms with a simple press of a button. 9 Buttons + DPI Switch: Configurable via Sentey’s software package, the nine buttons provide for plenty of customization for any gamer. 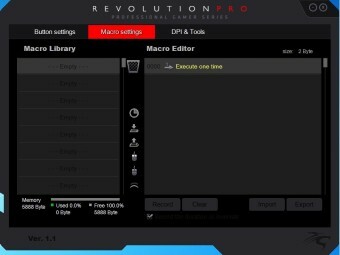 The DPI switch is used to select one of 4 customizable DPI settings. Each profile provides the ability to use custom macros and button settings as well as a different color for the LED indicator. 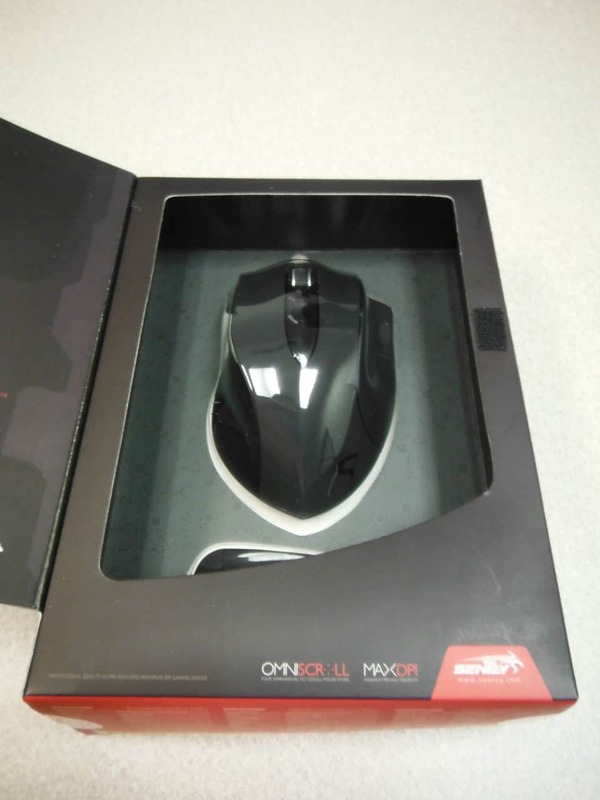 OMNISCROLL: Sentey’s OMNISCROLL technology provides a tilting mouse wheel. 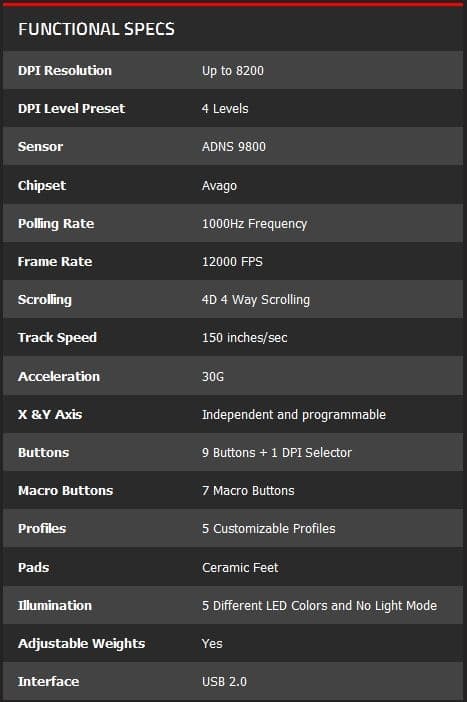 Up to 8200 DPI: Using the Avago ADNS 9800 chipset, the Revolution Pro SP has a maximum setting of 8200 DPI. This setting can be adjusted in increments of 200 DPI. The X and Y axis of the mouse are independent from one another, so side-to-side movement can be adjusted independently from forward and backward. 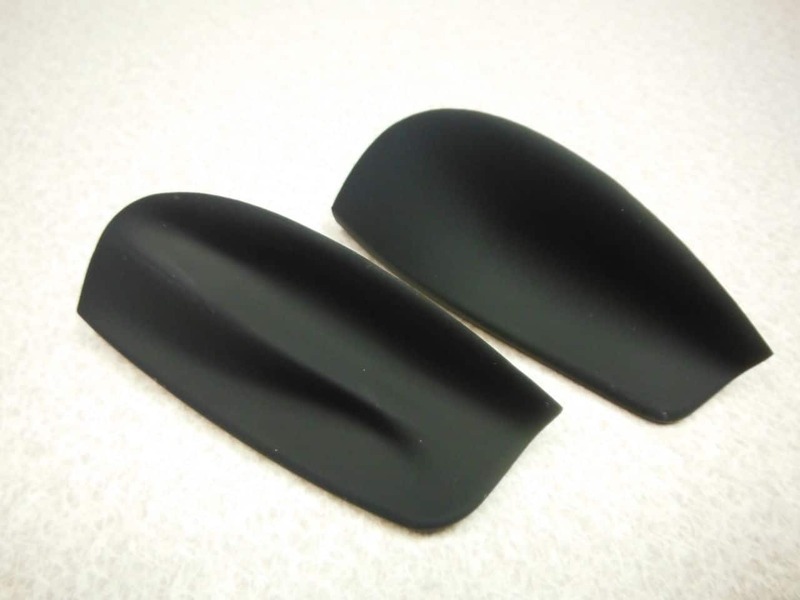 5 Ceramic Mouse Feet: The 5 ceramic mouse feet provide a low coefficient of friction to provide smooth movement no matter your mousing surface. Sentey touts the use of ceramic because of its extreme durability. 26 LED Colors: Don’t like the default colors of the 5 included profiles? No problem. There are 26 different colors to choose from, and you can even disable the pulsating glow of the mouse if you would like. 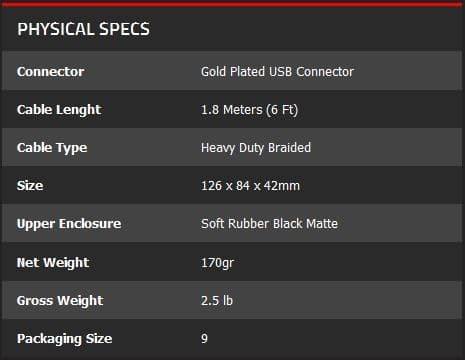 Heavy Duty Braided Cable: Coming in at nearly 6ft in length, the braided cable adds a nice premium touch to the Revolution Pro SP. A cord this long allows some extra leeway when configuring your desk layout. Ergonomic Thumb Grip and Interchangeable Side Grips: Depending on your personal preference, you can use a traditional smooth side panel, or choose the more sculpted panel that separates your ring and pinky fingers. 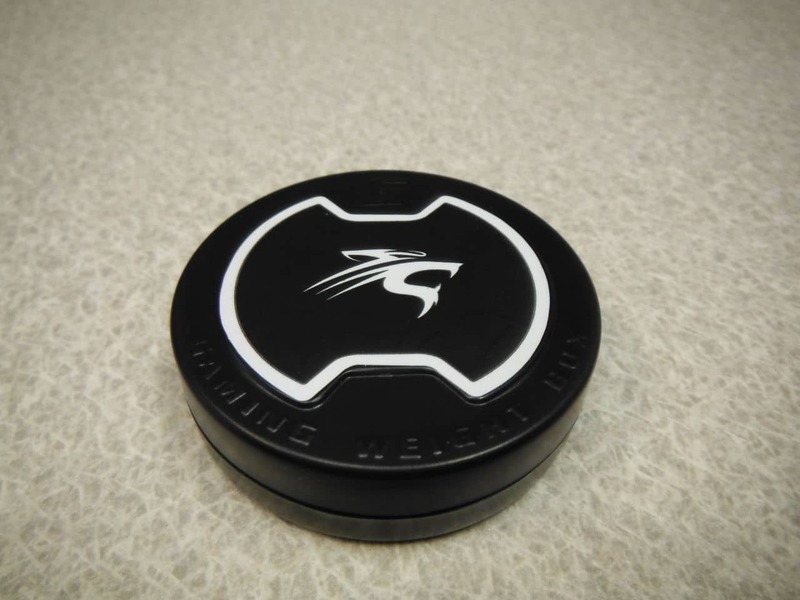 The ergonomic thumb grip features a textured rubber surface for comfort and control. Lift Button: Provides a custom tracking setting to ensure the mouse tracks properly on the surface it is used on. Adjustable Weight: The Revolution Pro SP includes 6 five-gram weights that can be added to or removed from an internal tray for a custom feel. A handy carrying case is provided for the unused weights. 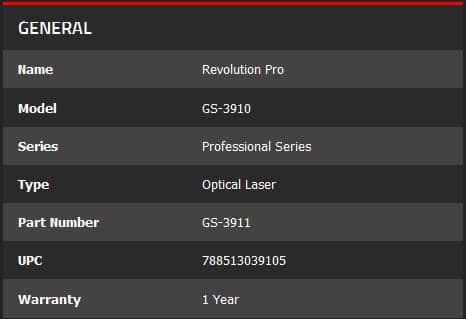 Below is a look at all the specifications that Sentey lists on their site for the Revolution Pro SP. Sentey provides a nice retail display box for the Revolution Pro SP, highlighting many of the great features found on their flagship gaming mouse. 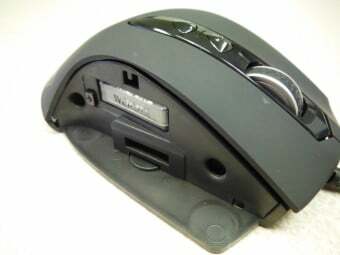 The front panel opens to reveal a top-down view of the mouse, as well as the included optional side grip. 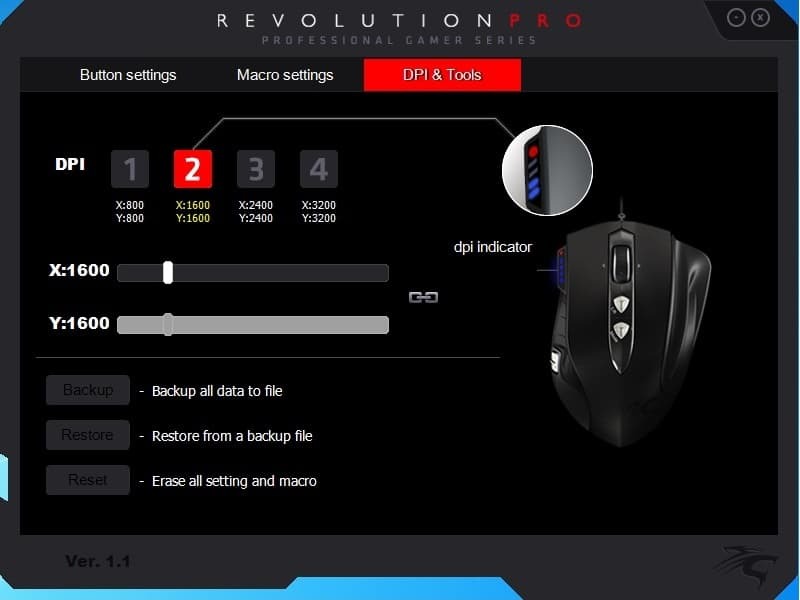 Taking a quick tour around the Revolution Pro SP allows us to see some of the features that Sentey has included in their offering. 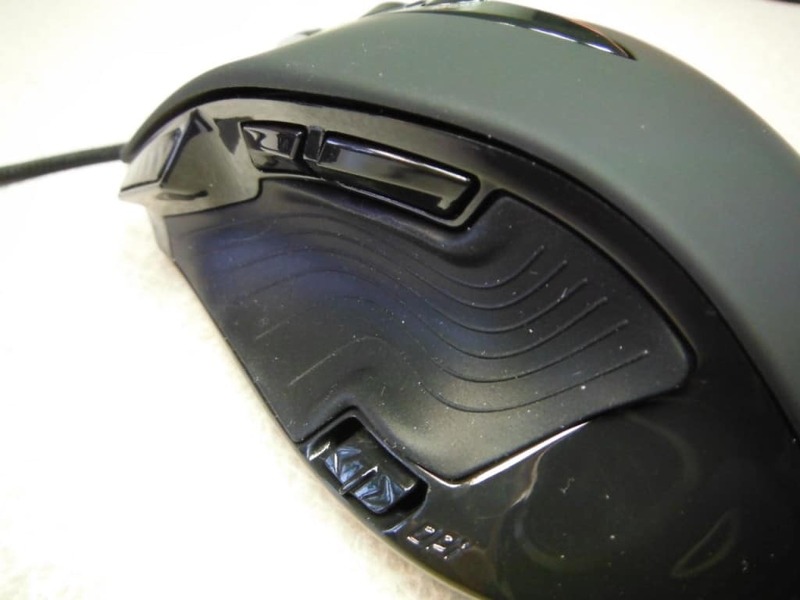 The rubber grip on the scroll wheel tends to latch on to every random speck of dust and fuzz that it comes into contact with. While it does provide a nice grip, we hope that debris won’t accumulate internally. This angle also gives us a good look at the DPI indicator lights towards the bottom right of the image. Here we get a good look at the textured rubber thumb grip and the two thumb buttons above. 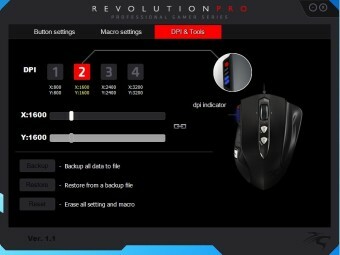 Down at the bottom of the Revolution Pro SP is the DPI rocker switch that allows for in-action DPI adjustments in each profile. 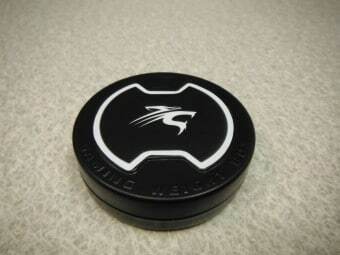 Again, we have a rubber surface that attracts lots of small particles. The front-end of the mouse is home to the 6-foot long braided cable, with a gold-plated USB 2.0 connector. 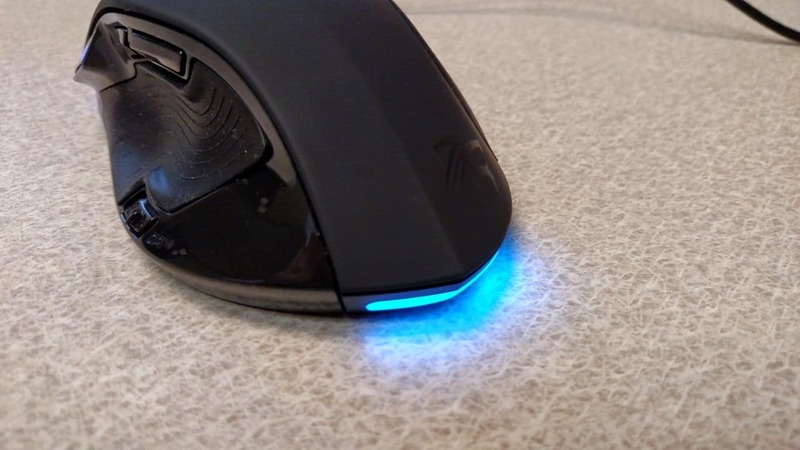 Just below the left and right mouse buttons are two LED “headlights” that pulsate one of 26 colors depending on the profile that is selected. 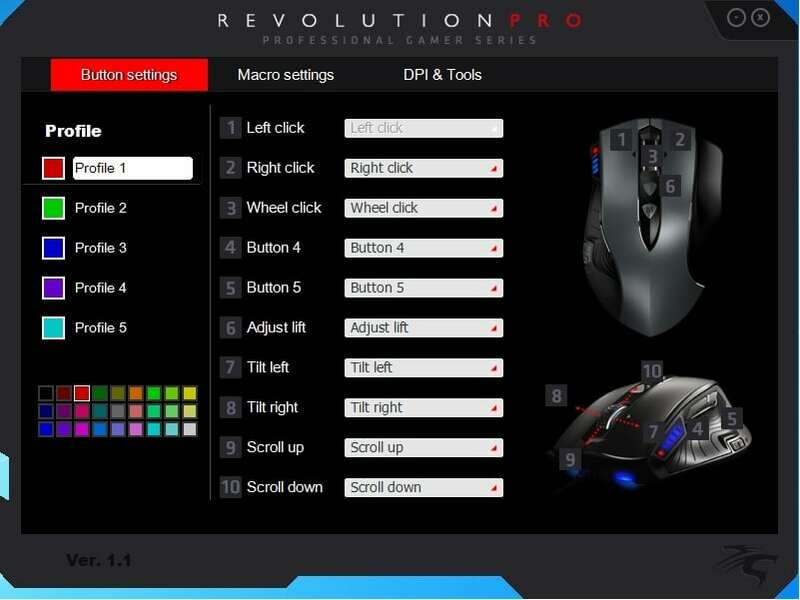 Flipping the Revolution Pro SP over we can see the 5 ceramic mouse pads that provide smooth gliding movement on any surface. On the left side is the button to release the side grip and gain access to the weight tray, and to the left we have the opening for the Pixart ADNS-9800 sensor. Towards the bottom of the mouse we have the rear light bar that also pulsates one of 26 colors along with the front lights. 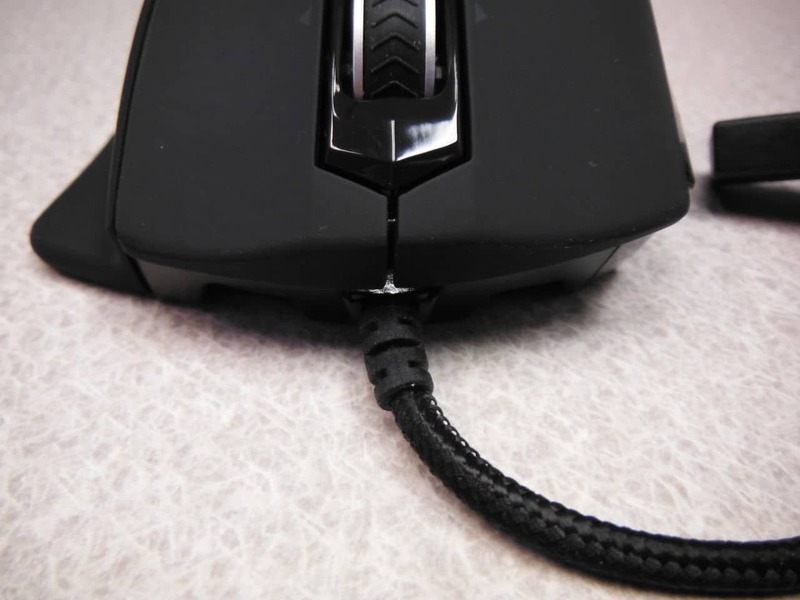 Once the button on the bottom of the mouse has been pressed and the side panel has been removed, we can start adjusting the weight of the Revolution Pro SP. 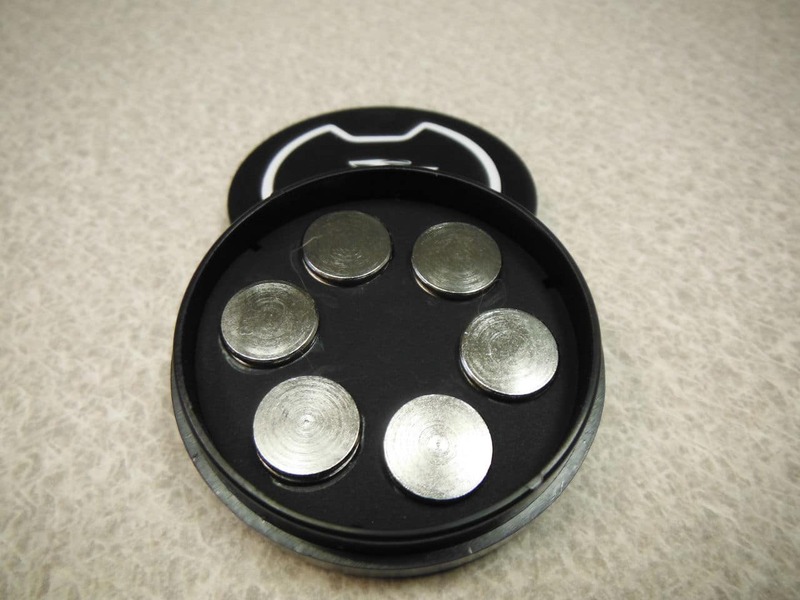 Simply press the release button to the left of the weight tray and it will pop out, revealing 6 empty slots for weights. Just insert your desired weights from the included carrying case and pop the tray back in. The 6 weights that Sentey includes with the Revolution Pro SP come in a handy carrying case which can easily be tossed into a bag to travel to LAN parties. The two available side grips allow for a custom fit for the right hand ring and pinky fingers. We found the molded split-finger grip to be a bit too “tight” feeling during use, but it is nice to have that option. 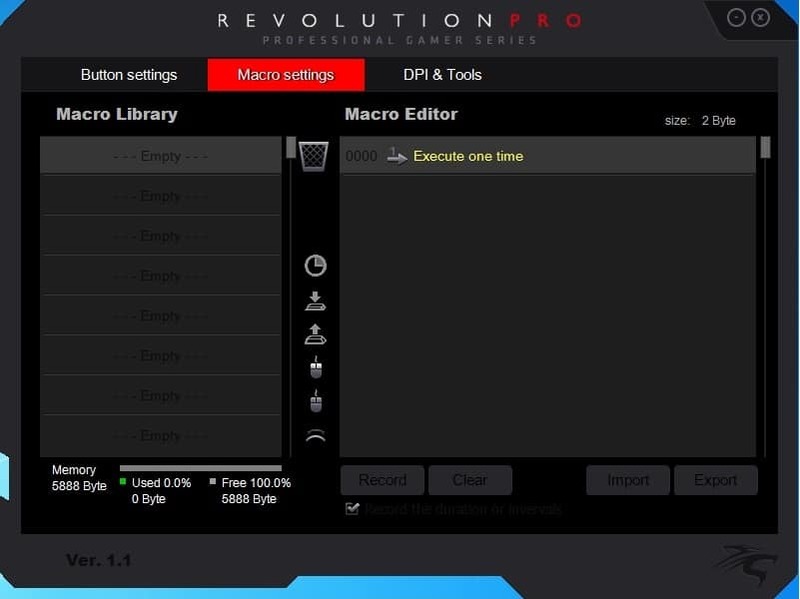 Sentey includes a pretty basic software application that allows users to customize the Revolution Pro SP to better align with their needs. There are 5 profiles that can be configured, each with its own name, button settings and custom color. Unfortunately, the names of the profiles are limited to 8 characters, so full names of games or applications may not fully fit. Macro settings are available to bind certain commands to mouse buttons. For example, you could bind a button to enable your push-to-talk ability in a game instead of using your keyboard. DPI adjustments can be made to the X and Y axis either independently or linked. Once your DPI settings have been adjusted, you can then switch on the fly using the DPI switch just below the thumb grip. 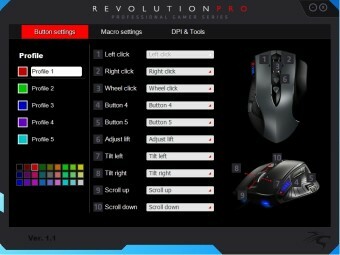 The selected DPI setting is represented by blue LED lights next to the left mouse button. You can also backup your mouse data and restore to another location, or set the mouse back to default settings. First things first, the Revolution Pro SP is far from what I am used to using on a regular basis. Both my work and home PC utilize a standard OEM 2-button scroll mouse manufactured by one of the largest peripheral makers in the industry. To say that the move to the Revolution Pro SP was a bit of a chance would be an understatement. The first thing I noticed was the size compared to my standard mouse. 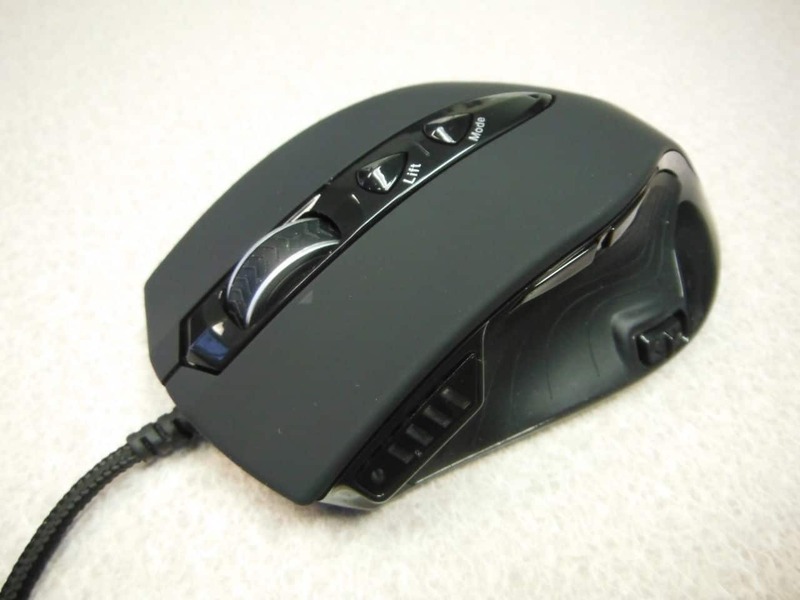 The Sentey mouse was quite a bit longer and wider than what I was used to using, but in the two weeks I have spent with the Revolution Pro SP, I have adjusted quite nicely to the size. The next thing I noticed was the ability to simply use the additional thumb buttons to move forward and backward in a web browser. 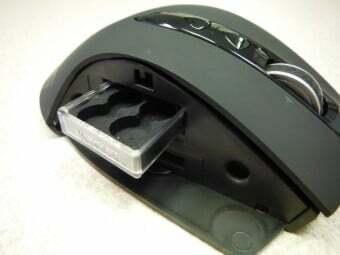 While this is nothing new in terms of mouse technologies, it does make a big difference moving from a more demure mouse. Creating custom bindings for these thumb buttons allowed me to switch between weapons on the fly in FPS games without taking my finger off the trigger. Can’t do that with a 2-button mouse. One thing that took a bit to get used to was a slight ridge that protects the two thumb buttons from being pressed. This ridge made the transition to these buttons a little cumbersome, but not a deal breaker. Once in your hand, the feel of a few different textures and materials shows that Sentey put some thought into making a quality product. 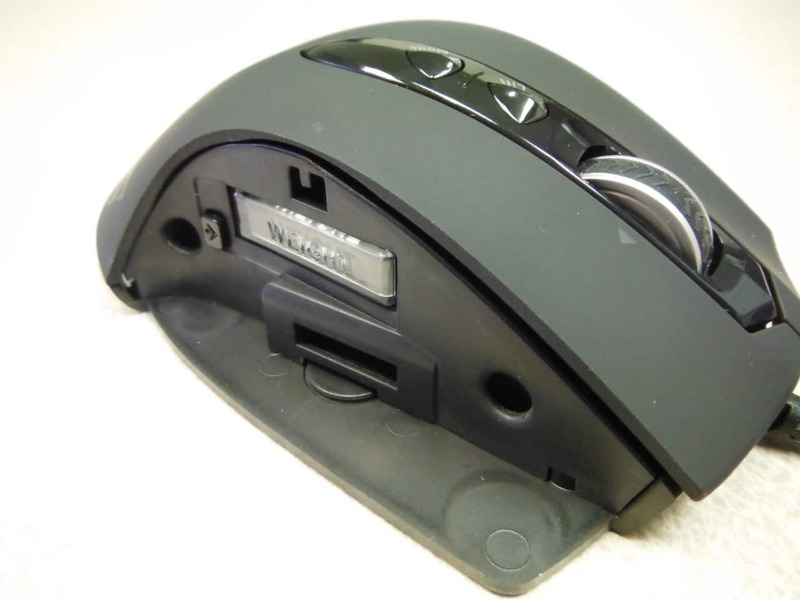 The main body of the mouse is made of a soft-touch plastic that provides a nice grip for your palm as well as your left and right mouse button fingers. 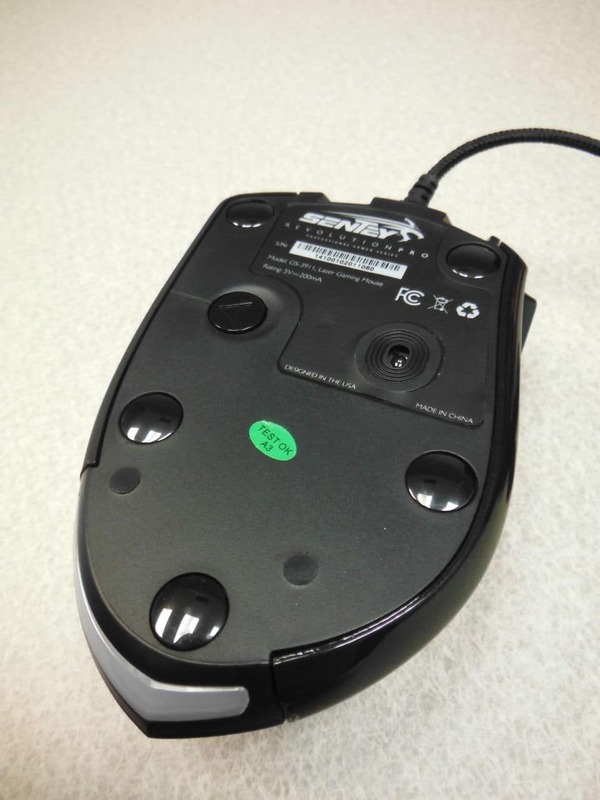 A Sentey logo is placed towards the back of the mouse and is not overwhelming compared to some companies that plaster their logo everywhere. The same material is present on both of the included side grips. Your thumb however will rest on a textured rubber grip that sports a pattern similar to that found on a topographical map. Both of these materials and textures were very comfortable during the entire testing period which included multi-hour gaming sessions, as well as day-to-day mouse usage surfing the Internet, etc. My mousing surface of choice is just a standard cloth mousepad with a printed image and after using the Lift button to adjust to this surface, the Revolution Pro SP provided not only a physically smooth feel, but the on-screen movement was very smooth as well. Changing to a different surface simply required another calibration from the Lift button (which only takes a few seconds) and the mouse was ready to rock on the new surface. In addition to the printed mousepad, the sensor was also tested on a laminated wood veneer surface as well as a Formica desk top. Both hard surfaces were no problem for the mouse after its sensor setting had been adjusted. Adjusting the weight of the Revolution Pro SP is a breeze. 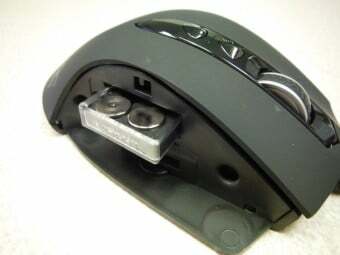 Simply flipping the mouse upside down reveals a cartridge release button that allows the removable side grip to come off of the mouse body, revealing the weight tray. A quick press of a button pops the tray out and from that point on you just add or remove the desired weights to the tray and pop it back into place. This tray system is nicely made, and provides a snug fit to each of the weights used, no matter how many are installed. Personally I prefer a light weight mouse, so that will be my go-to setup, but having all of the weights installed in the tray gave a nice solid feel to the Revolution Pro SP. While there isn’t much testing to do in regards to the LED lighting feature, it is still worth mentioning. 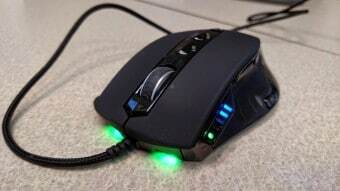 At the front of the mouse near the cable are two colored LED “headlights” that pulsate on and off in the color related to which profile you have selected. 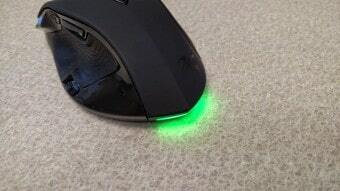 The same colored light also pulsates at the rear of the mouse near the bottom. A single LED indicator next to the DPI indicator lights also pulses in the same color. When in use however, the only light that is really visible is this single LED grouped with the DPI lights. Your hand and wrist cover the rear lights, and unless you are using some crazy grip, the front LED lights won’t be visible to you. The lights do look cool when the Revolution Pro SP is sitting idle on your desk; pulsating and begging you to get back to gaming. The option to disable the lights is also present, although a bit tricky for some to figure out. You have to select the color Black for the LED lights in the Sentey software to essentially disable the lighting. The overall build quality of the Revolution Pro SP appears to be great. The use of nice materials like soft-touch plastic and ceramic mouse feet shows that Sentey cares about what they put out to market. The braided cable is another nice touch that give this mouse a more high-end feel. Sometimes you can tell something is of low quality just by putting it in your hand, but the Revolution Pro SP does not have this problem. Sentey has put a lot of time and effort into designing and producing their Revolution Pro SP, and it really shows in all the great features. The customization that Sentey’s software provides allows for multiple profiles, each with their own custom settings for each button. On-the-fly adjustments can be made with a quick toggle of the thumb DPI switch, or tap of the Mode button to change profiles. 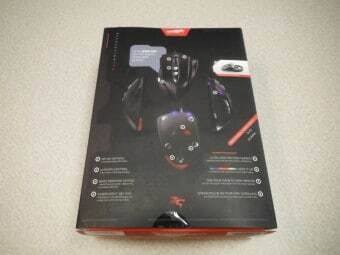 If you are looking to move on from a standard two-button mouse or maybe even thinking of replacing an existing gaming mouse, the Revolution Pro SP from Sentey is definitely worth giving a shot. Another awesome feature of this mouse is the price. 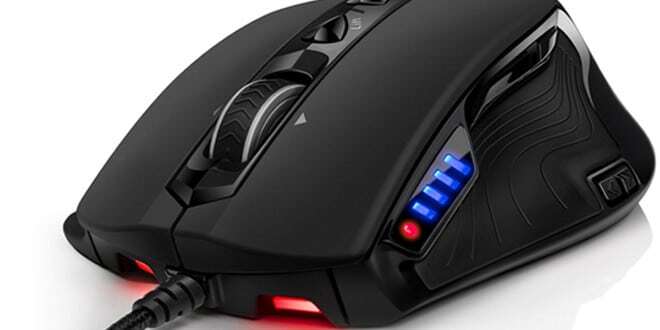 While Sentey lists the MSRP of the mouse as $89.99 USD on their website, they are currently selling them on Amazon for $29.99 USD as the time of this articles publishing. Crazy cheap! 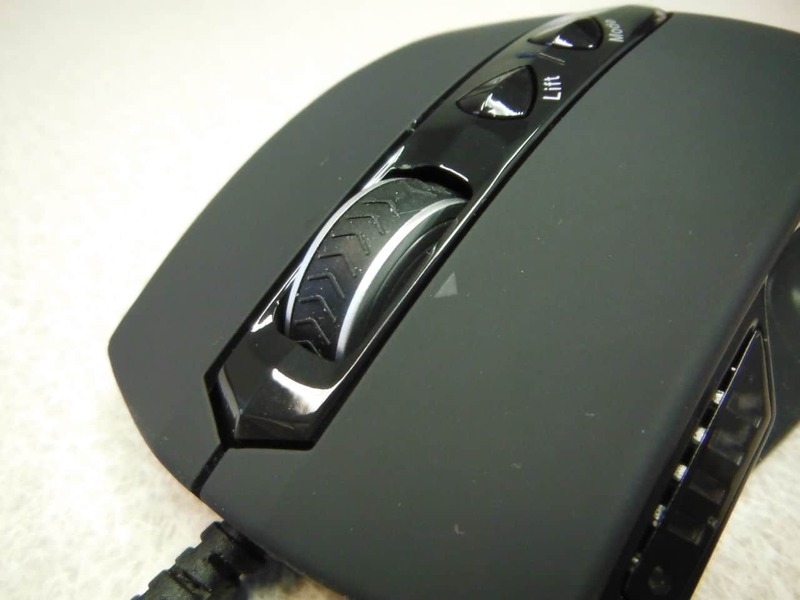 Overall, the Revolution Pro SP from Sentey provided us with a great grip on our gaming experience, and we really think it is a contender in a large field of mice looking to earn your trust. 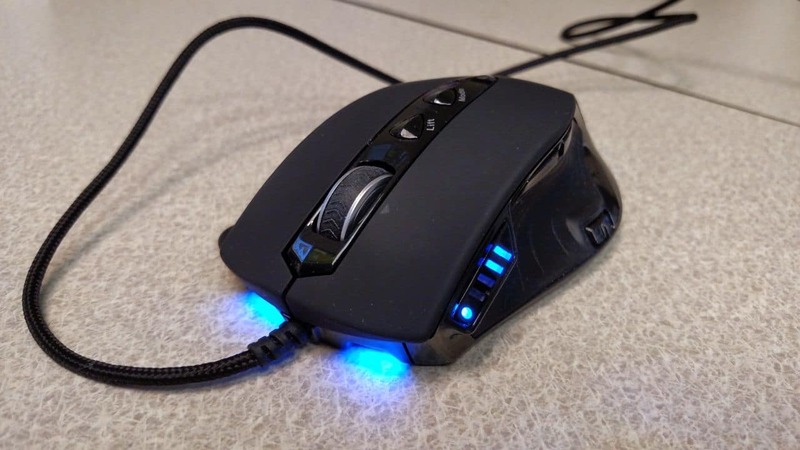 Overall, the Revolution Pro SP from Sentey provided us with a great grip on our gaming experience, and we really think it is a contender in a large field of mice looking to earn your trust. Bought it March 2015, it’s still going strong. Has far outlasted the $80 Logitech that preceded it, and outperforms it as well. No longer available on Amazon which is unfortunate, I would buy again when this one eventually gives up the ghost. It mouses perfect on my recliner arm without need for a mouse pad. Love this thing.